does she like bright colours? Another day … another smock. Having two Stylish Dress Books in my possession and 52 patterns at my disposal, the permutations are endless. However, whilst ultimately rewarding, the initial spade work involved for each new pattern – tracing and transferring to pattern paper – verges on the arduous. So, I couldn’t resist the allure of tried and tested when it came to this frog adorned fabric from John Lewis. Revisiting Stylish Dress Book: Wear with Freedom’s Dress E was pure indulgence. Having pre-cut pattern pieces to size and demystified the beautifully succinct instructions first time around, assemblage was a dream. 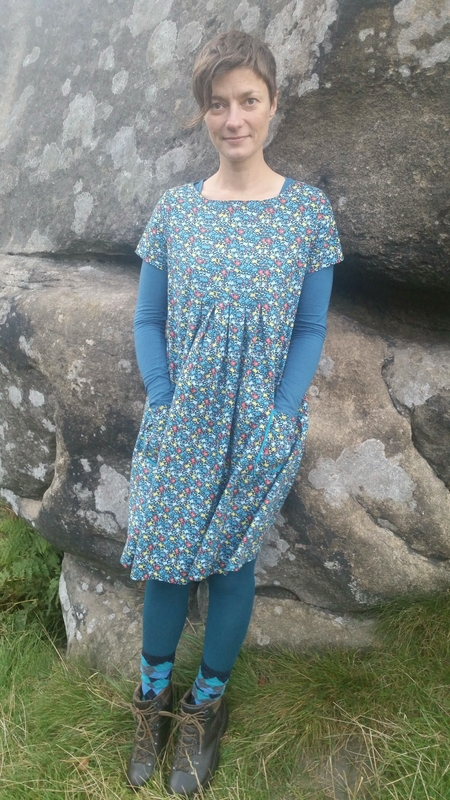 I changed it up a tad with a pattern mash up – substituting the pockets with Dottie Angel’s glorious imaginings and extending the length, including Yoshiko’s capped sleeves for good measure. Does she like bright colours? Yes, she does. Thanks for the kind words as always. I thought the design was subtle too – funny that the assistant thought it suitable for a child – it didn’t occur to me until she said it! It’s true what you say about the myriad of choice – one pattern can be transformed over and over by the fabric and colours you choose. I’ve totally gone off buying clothes from shops now – everything looks so limited when I think of all the creative options available to me. I just wish I had more time to devote to my passion – life keeps getting in the way! Oh I do love your latest creation. From a distance the pattern looks floral. It’s such a feminine number and the co-ordinating tights, tee and socks bring it all together beautifully. Delightful! Yes but does she like frogs??? ?